Skirts billowing, arms whirling and feet cutting the air, the Louisiana Dance Theater company recently brought choreographer Dianne Maroney's "Obsessions" to the Strand Theater stage in Shreveport. Though young, the LDT dancers exhibited the clarity that is produced by practice and discipline. Ashley Murphy gracefully sent each of her limbs to its fullest extension each time she danced. A graduate of LDT, she has toured America and Europe as a member of the Dance Theater of Harlem. She is unusually expressive and graceful. And Michael Philips, a tall fellow who is nonetheless a high school freshman, stunned the audience with speed, jump height and rhythmic precision. Philips has been blessed with enormous ability. He reminded me of a sort of Kenny Wayne Shepherd of dance by his verve, lanky physique and streaming blonde hair. Impulse Dance Theater of the Louisiana School at Natchitoches made a spirited addition to the evening. Still, the seasoned senior corps of LDT were commanding in appearance and technique. Laura Angle, Megan Burdick and John Anthony Anglin stood out by their stamina and style on the Strand Theater stage, Shreveport, Monday night. 2nd annual Battle of the Bands, according to ShreveSpoon. Hebert a call at the KSCL office at 869-5296. In the photo: Dossett, Teekell & Tubbs. Thomas Phillips, clarinetist, will be featured soloist in the Shreveport Symphony Orchestra's "Orchestral Romance" chamber concert. The performance will take place at Hurley School of Music - a splendid room for bathing in music - at Centenary College, Thursday, Feb. 3, at 7:30 pm. Phillips is one of the most watchable performers in the SSO. He is intensely connected to the music and to his ebony and silver instrument. His visage is that of the uncompromising musical artist. And his tone is sweet and inquiring as well as sure of foot. Tickets to the concert are $15 and you may pay at the door or call 227-8863. Student tickets are $5. Attendance at SSO concerts and the chamber series is at a high mark this season, according to Paula Leonard, president of the SSO board. 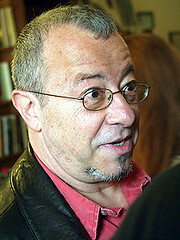 NPR commentator and author Andrei Codrescu is America's favorite Mork. He will speak at Caddo Magnet High School, Shreveport, Wed., Feb. 23, at 6:30 pm. 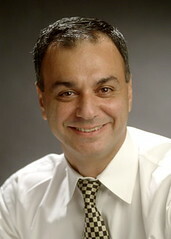 Romanian-born, he is today a citizen of Louisiana and, additionally, of America. He teaches at LSU, according to a recent bio, and resides in both New Orleans and Baton Rouge. His visit to Caddo Magnet High School is sponsored by the Mary Jane Malone Lecture Series. The Malone family memorial has brought to Caddo Magnet High and to Shreveport authors such as Edward Albee, Miller Williams, Sylvia Nasar, William Joyce and Ernest Gaines. Codrescu's talk is free and open to the public. More info: Caddo Magnet High School, 221-2501. LDT preparing for their performance at the Strand Theater Monday, Jan. 29, at 7 pm. 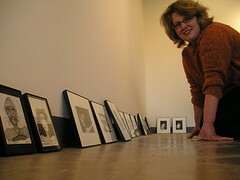 In the foreground: Ann Payne. Ashley Murphy of Louisiana Dance Theater - she has toured the US and Europe as a member of the Dance Theater of Harlem - and guest dancer Darion Smith practice their pas de deux prior to their performance Monday, Jan. 31, at Shreveport's downtown Strand Theater (226-8555). More info: Carol Anglin Dancenter: 861-3006. 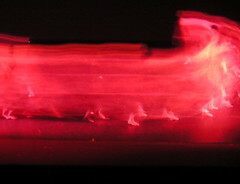 The performance, called La: Dance Alive! 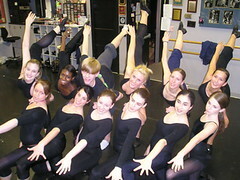 2005, will also feature Impulse Dance Theater of the Louisiana School for Math, Science and the Arts. The show begins at 7 pm. Bistineau Gallery is part of Kristi Hanna's Harmony Center in downtown Shreveport. Michael G. Moore is a painter and founder of Northwest Louisiana Art Gallery. 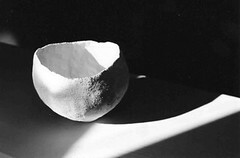 The artists in the group show, Bill Gingles, Mark Charleville, Allison Dickson, Robert Trudeau and Talbot Hopkins (see more on each of them earlier) each show their work on his online gallery. The Bistineau reception drew a variety of guests, from a young woman who'd come from fishing - she showed me the catfish slime on the sleeve of her leather jacket - to tuxedo-clad revelers on their way to Carnival balls. Past the urbane white walls of Bistineau Gallery visitors found they could enter the dark red walls of the Harmony & Healing Center, Kristi & Bruce Allen's home for dance, drama, cabalistic conjurations, sculpture and paintings - there are scores of large, exuberant canvasses by Kristi that may one day be reckoned a national treasure. 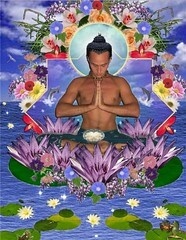 The untutored simply gawk; they cannot be expected to comprehend Hanna's vision or energy. Home to the intuitive and ever-evolving Visual Sound & Movement Dance Company, the center also hosts lessons in dance and yoga. There was a mirrored sitting room. Sinuous music emanated from the dimly lit audience seating area. There was a darkened stage surrounded by large paintings and filled with rag sculptures. Entered via another passageway was Robin Rothrock's romantic art gallery. "Even the bathrooms are totally amazing," one guest said. They are vividly painted in messages and symbols from foot to lightbulb. The art by Bill Gingles, Mark Charleville, Allison Dickson, Robert Trudeau and Talbot Hopkins, can be seen by appointment with Rebecca Hudsmith, at 464-1142. Louisiana Dance Theater corps de ballet: Kristen Rice, Ann Payne, Elizabeth West, Claire Bayer, Allison Sauls and Liz Weiss are the front row, l. to r. In the second row are Tricia Barrow, Ashley Murphey, Michael Philips, Kelly Long, Laura Angle and Sydney Seid. Their director is Carol Anglin. See them at the Strand Theater, downtown Shreveport, Monday, Jan. 31, at 7 pm. Joining the LDT is Impulse Dance Theater, Louisiana School for Math, Science and the Arts. Tickets: Carol Anglin Dancenter, Pierremont Mall, 318-861-3006, and the Strand, 226-8555. Bill Gingles is one of the region's most accomplished painters, showing in galleries in Houston and New Orleans. He is part of a group show currently in view at Stephen F. Austin University, Nacogdoches. Textures on Gingles' multi-media canvasses appeal to the viewers' need for sensual, tactile stimulation. The of the old walls, buildings and ruins he's seen in Italy inspire him in regards the relief of his paintings. The Times' Jennifer Flowers interviewed Gingles Jan. 28. See it here. 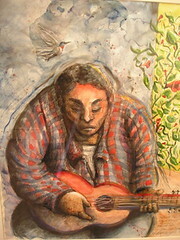 Bistineau Gallery's reception is from 6 to 9 pm, Sat., Jan. 29, and features the work of Gingles and 4 other artists. 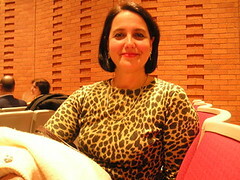 For more background, please see the January 17 post on Bistineau owner Rebecca Hudsmith. Popping into a Mercedes: Sally Gardner will chair the 16th Annual Shreveport Symphony Orchestra Luxury Raffle. Ticket buyers are supporting the SSO in one of its most important fund raisers. 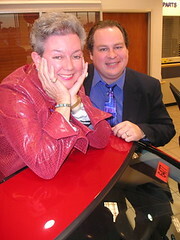 With Sally is SSO music director Kermit Poling. Buy a raffle ticket online? Why, yes; thanks for asking. Your odds in this raffle will be excellent, I expect: at the penultimate extension of community love, the SSO board and helpers will sell no more than 2005 tickets. Want to help sell tickets and support a vibrant community institution? Call me at 318-861-6809. The Krewe of Centaur den was the site of the KTBS morning news broadcast this week as Carnival craziness grabbed the Shreveport-Bossier region. Trudeau talked with host Rick Rowe about Carnival history and led a curvaceous second line. Costume designer Desmond Ashley and Centaur power woman Suzy Ryan were on hand to explain the new bangled and be-feathered creations being worn on the floats. 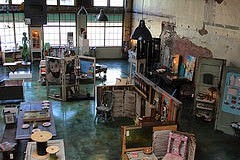 The cavernous Centaur den, on North Market near downtown Shreveport, will be open this weekend for the loading ritual. The krewe's parade rolls Saturday afternoon at 4 pm. Last year Shreveport Times photog Robert Ruiz captured the parade. Rachel Stuart-Haas: "Confounding her emotions"
Shreveport resident Rachel Stuart-Haas has a painter's background that includes Aix-en-Provence, France, and Kansas City. This piece, acrylic on canvas, is part of a Houston show called "Wayward delinquents." It's on view this month at the downtown Commerce St Artist Warehouse. For more on the show, see HoustonPress.com. 1. Rex is the best-known krewe of New Orleans but it is not quite the oldest. That distinction belongs to the Mystick Krewe of a) Comus b) Proteus c) Zulu. 2. The horse-mounted men of the Cajun courir de Mardi Gras ride to their neighbors' farms to entertain and to request a) the loan of their first-born son b) a round of beers c) a contribution to the gumbo d) a kiss from each of the ladies present. 3. New Orleans still has nighttime parades illuminated in part by men carrying pole-mounted torches. The torches are called a) doubloons b) flambeaux c) throws. 4. The New Orleans krewe with the biggest floats and the most throws: a) Rex b) Bacchus c) Zulu d) Mid City. 5. 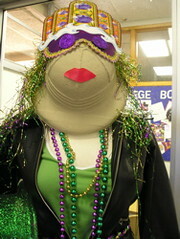 New Orleans also celebrates the arrival of Rex at the river front on the day before Fat Tuesday. 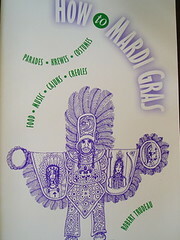 That day has a French name, too: a) Lundi Gras b) Jeudi Gras c) Dimanche Gras d) Vendredi Gras. 6. The first krewe to roll on Mardi Gras morning is the one that traditionally did not print a specific parade route: a) Rex b) Comus c) Zulu. 7. The nation with the longest Carnival season; it begins in November. a) Germany b) Brazil c) Trinidad d) France. 8. This nation features a Women's Parade Day during which the females on the floats may descend into the crowd to grab men for hugs and kisses: a) Brazil b) Belgium c) Italy d) Germany. 9. Costumed riders throw oranges at the crowd according to an ancient custom in the Western European town of Binche, in a) Germany b) Belgium c) Trinidad. 11. In England the day we know as Fat Tuesday is called Pancake Day or a) Clove Tuesday b) Shrove Tuesday c) Mauve Tuesday. 12. The largest Carnival gathering in the world: a) New Orleans b) Rio de Janeiro c) Munich, Germany. Sources: The New York Times, Carnival, American Style, Kinser; Carnival, Orloff; Mardi Gras, A Celebration, Osborne, and Mardi Gras, Huber. 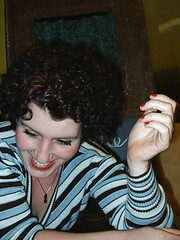 Sonja Bailes, Ch. 3 News Shreveport, has invited me to join the morning news team at the Centaur den Wednesday morning, Jan. 26, to discuss Carnival lore. Please join us. Robert Trudeau: I've seen your work at David Nelson's gallery, yes? And at Turner Art Center with the North West Louisiana Art Gallery group. Allison Dickson: Yes! I curated at voodoo for a year, so 12 shows. 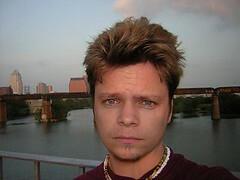 I'm not sure but it was around 2002 and 2003. I also showed at Sweet Lucinda's, the Uneeda building, Barristers (in New Orleans) and some others. I also try to put on an annual show of unconventional fashion. We did it for 3 years at the west edge before that ended. They were called robots and girls, sleepyear and giant monster wrestling. See Dickson's recent work at Bistineau Gallery. A reception will open at 6 pm Saturday, Jan. 29. For more info, please see below. 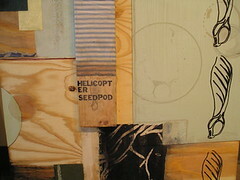 Robert Trudeau: I shot a photo of your piece called "helicopter seedpod." Your explanation? See this work at Bistineau Gallery on Saturday, Jan. 29, 6 to 9 pm. See below for more on Bistineau gallery. Jean Despujols is the Parisian painter who captured scenes of Indochina in the 1930's. 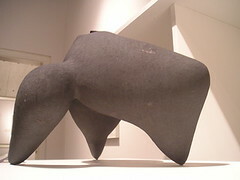 The collection of his work at Meadows Museum of Art, Shreveport, offers a wealth of sensuality. Currently the Meadows exhibit is arranged so that there are 4 rooms of Despujols work on display. It presents an unusual opportunity to learn about the historic landscapes, peoples and costumes of Vietnam, Cambodia and Laos. This entrancing vessel is part of the "Contemporary Japanese Crafts" exhibit currently on display at Meadows Museum of Art, Shreveport. Though the exhibit occupies only one room at Meadows, incalculable stimulation awaits those who enjoy Japanese culture. There's something for everyone, as you can see from the works' categories: 1) Ostentation, 2) Quiet Refinement, 3) Crispness, 4) Fine Detail, 5) Deformation, 6) Flowers & Birds. Times arts reporter Jennifer Flowers interviewed museum director Diane DuFilho about the 70-item exhibit. "We're hoping to do more international exhibits in the future," she told Flowers as she revealed an upcoming show of photos of Tibet. Meadows will keep the Japonica through February 20. 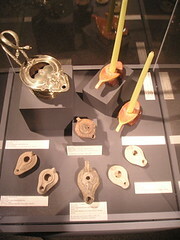 From clay oil lamps evocative of the biblical era to 20th century lighting implements, this exhibit from the New Orleans Museum of Art provides encrusted enlightenment. Alas, the exhibit ends Jan. 30. Please call 869-5169 for their limited hours. Red River Radio and Fairfield Studios bring us the much talked-about House Concert Series. Next show: Lynn Adler & Lindy Hearne. Raku pottery by Edward Wilson. Photo by Talbot Hopkins. To be shown at Bistineau Gallery on Jan. 29, at 327 Market St., Shreveport. Talbot Hopkins is a gifted portrait artist and works by commission in graphite, pastel and watercolor portraits. She also paints still lifes in oil and watercolor. 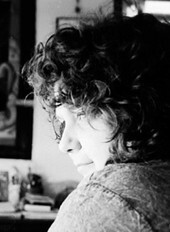 In recent years she has fallen in love with capturing images via her camera. 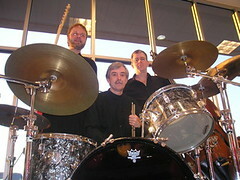 Best Jazz Trio in Shreveport? Probably So. Chan Teague, drums, Henry Ward, guitars and violin, and Chris Allen, bass: all are members of the Shreveport Symphony Orchestra, but they do something else; they swing hard in the Miles Davis vein. You can catch Chris Allen on Thursdays at the Noble Savage. 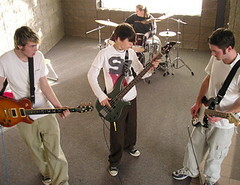 He is joined by Matt Harris, keyboards, and young Daniel Breithaupt, percussion, and by guest musicians. The Noble Savage is on my highly recommended list. I've written more about it at Northwest Louisiana Art gallery.com. Costumes, music, food, traditions, krewes: this little guide - 36 pages, 36 illustrations - has all the info you need to maximize your enjoyment of the season. It's cool for visitors, for your relatives, for students or those who want a quick study of what all the craziness is about. People send them out across the nation, across the pond, to describe to their friends what is going on and why they're wearing those marvelous tuxes and gowns. Buy a copy at Tubb's Hardware / Cajun Gifts and Mardi Gras Center on Benton Rd across from the Bossier Civic Center. Don Tubbs has assembled a most amazing array of masks, beads, CD's, umbrellas, you name it. You will also find it at two other terrific shops, Enchanted Garden on Line Avenue or at Tower Books, across the street from SteinMart. Or you may call author-publisher Robert Trudeau at 318-861-6809. Hey, ya'll: laisser les bon temps rouler! Mark Charleville is both a commercial designer and deeply committed artist. It chafes at him to work in the dessicated world of quick-and-dirty production. But like many fellows, he learned as a youngster to make the best living possible. 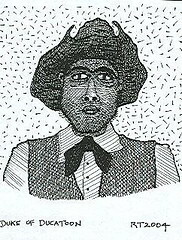 Charleville is a garrulous fellow, yet he enjoys isolation, residing with wife Lilly Daigle way in the country. The oils he will present at Bistineau Gallery on Saturday - please see below - explore the woods, animals and people found deep in the Louisiana bayou territory. These paintings evoke a dark world and scary stories. Yet the subject matter and mood seem appropriate for the Carnival season. Be aware that he has captivated viewers throughout the region with his insightful bayou scenes. 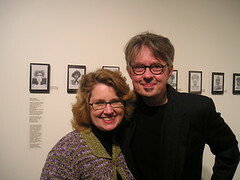 recently) and people (Carl & Carrie Bearden, for example) and the paintings and sculptures that suit them. Saturday, Jan. 29, she presents 5 regional artists at Bistineau. The reception is 6 to 9 pm. You are invited. More info: 318-464-1142. The artists: Allison Dickson, Mark Charleville, Bill Gingles,Robert Trudeau and Talbot Hopkins. 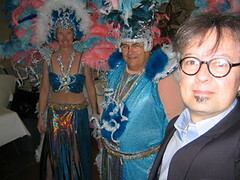 A character from Trudeau's Chuchos de Carnavale series. To be shown at Bistineau Gallery, Shreveport. The show opens Sat., Jan. 29, with a 6 to 9 pm reception. Carnival masks optional. More info from gallery owner Rebecca Hudsmith: 318-424-1142. She shows the art at Bistineau by appointment. Through Feb. 13, according to their web site, the exculpated bodies of les personnes plastiques: Cirque du Soleil. My daughter Annabel says the show is in a tent at Reliant Park and all the seats - including the $41 tickets - are terrific. Also, the costumes for "Varekai" are ungodly, says Annabel. Piano jazz is where I bathe. One of my brimming fountains of joy and cleanliness is Marcus Roberts. Once pianist with Wynton Marsalis, he has made a tub of albums on his own. I have one fublime favorite: "Alone with 3 Giants." It is a solo and serene take on compositions from Ellington, Monk and Jelly Roll Morton. 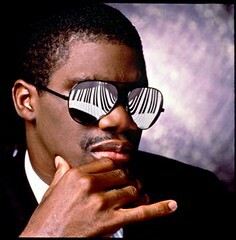 Who's your piano jazz person? Your platonic disk? It's killingly fast. 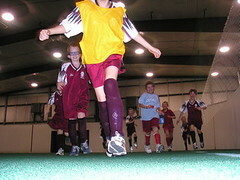 And it's a do-or-die skill builder: it's indoor soccer at S'port Port. Stephen, Kurt, Charlie, Jett, and teammates sprint for the bench after a cardiac 22 minutes of play. And the Shreveport facility offers teams and leagues for All Ages. Two people have actually told me, "Hey, bro, come on!" No, I don't have the skill or the courage to dive onto the floor with anything but a camera. The world-class voice of award-winning gospel singer Stephanie Dotson electrified the audience of some 1000 at the Jan. 14 SSO concert. Soloist Monica Blake Mickle also won a big response from the crowd. The responses to the gospel singers' efforts included whoops of delight and punctuations of joy such as "Oh, yeah!" and "Amen!" Radio personality Daddy Ro Wright, III, delivered expert narrations and recitations. 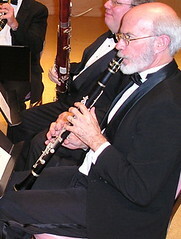 And the entire concert was crackerjack, owing to the gifted direction of SSO maestro Kermit Poling. Happily, the Times has returned to overnight reviews. Alexandyr Kent was in the audience and penned a comprehensive and insightful review. My hat is off the Times editor Alan English for his support of arts coverage. Next-morning reviews bring us a sense of excitement and raise the bar for performers. 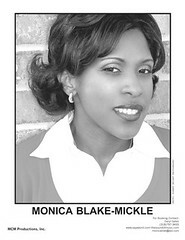 Friday night, Jan. 14, Monica Blake Mickle sings with a combined choir and the Shreveport Symphony Orchestra. Having heard her sing several times I can tell you it's going to be inspiring. At the Red River Revel she sang with jazz man Brian Blade. First, they sang duets to his folk-rock compositions. The following night she was one of the soloists when the Brian Blade Fellowship joined the Zion Baptist Church choir. She's got a soaring voice; it's melodious and powerful. "Perfect Peace" is the name of her CD. Once a year the SSO backs a giant choir and top soloists like Mickle. The event, called The People's Concert, is one of my favorite shows of the year. The audience is ebullient and responsive and the musicians thrive on the choir's energy. It begins at 7:30 pm. I'd recommend catching a shuttle from the AmSouth Parking garage. Enter from Milam Street between Market and Edwards. Wait on Milam for the complimentary A-1 Shuttle Bus to the Civic Theatre. The first shuttle pickup is at 6:30 p.m. The Times' hard-working Jennifer Flowers talked to singers and musicians this week about the People's Concert, which is underwritten by the generous Community Foundation of Shreveport-Bossier. .
First you hear chimey, intricate guitar melodies. And a wondering voice. Of a sudden a wall of rending, roiling volume pours out upon the listener. The crowd flings itself into vivisection. ALA, or April's Love Affair is a smart, hardworking screamo band. Having seen them in full cry I can testify that their show is vibrant. They've won a wharf full of moshing fans. Drench yourself in ballsy emo at 516 Soundstage (once the Woolworth's). 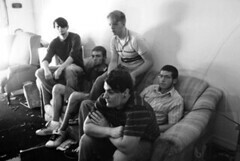 ALA plays Friday, Jan. 14 ($7) along with Statues Cry Bleeding and the Infinite Division. See more of my observations about 516 Soundstage and other local boites at the Art & Cafes page of Northwest Louisiana Art Gallery. I love to travel abroad. I'm a closet anthropologist. I hate it when people say vapid things like "art is my life," but hey, it comprises a great deal of my time. Why be ashamed? Afterall, great societies are remembered for their art. Cate Blanchett made the screen flap during the Katherine Hepburn segments of "The Aviator." The Australian actress isn't particularly pretty but she makes directors and audiences happy. Scorsese worked effectively with Blanchett and DiCaprio as well as with Alda and Baldwin. Later I wondered "How did he keep it aloft for 3 hours?" Also, "Why did I give a ** about the soulless Hughes?" Agh. That's Hollywood's gift: giving us a cad with enough surrounding fireworks so that we overlook the black hole. 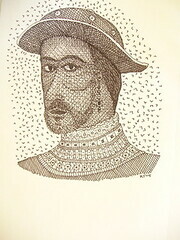 The Duke of Ducatoon is one of the Chuchos de Carnavale illustrations to be displayed at Bistineau Gallery in a show of Four Artists. The display will open with a Fete Rouge on Saturday, January 29. Allison Dickson, Mark Charleville, Bill Gingles and Robert Trudeau comprise the Four Artists. More info? 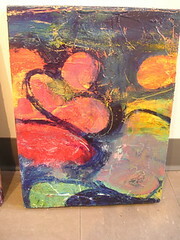 Bistineau Gallery, downtown Shreveport, is open by appointment; please call 464-7950 or 337-278-7950. Or buzz owner Rebecca Hudsmith at rhudsmith@aol.com. Shreveport's Fencing on Fairfield: "Gladiator!" 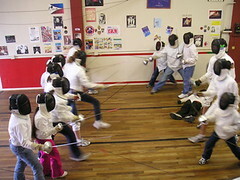 Fencing on Fairfield on a Saturday at noon: girls (l.) vs. the boys in a melee called "gladiator." Fencing master Andy Shaw and coach Terry Gamble create a cinematic experience on Fairfield Avenue, near I-20, Shreveport. 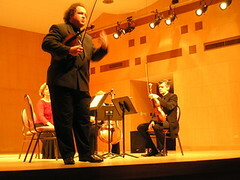 Kermit Poling and the Premier Quartet played 20th century pieces at Centenary College Hurley School of Music recently. On Friday, January 14, he will conduct the Shreveport Symphony Orchestra and several gospel choirs in the People's Concert, a performance dedicated to the memory of Martin Luther King, jr. The People's Concert is a sensual affair, well-attended (1100 last year) and offering soaring voices with stellar strings. Laura Crawford is a violinist, violin teacher and driving force behind the Centenary Suzuki School in Shreveport. She and husband Ed and the Suzuki parent team - the indefatigable Nita Cook among them - helped fill the Civic Theater in December with the "Home for the Holidays" Shreveport Symphony Orchestra concert. Accompanying the orchestra was a phalanx - some 140 - of proficient Suzuki students. Whether the focus was on Dianne Maroney's sweeping skirt and expressive body or a group of highly-rehearsed teens leaping across the stage, I have learned to trust Carol Anglin dance productions for graceful entertainment. In fact, I will happily go downtown on a Monday night to watch the Strand's stage ripple with the vibes from the Anglin troupe, La Dance Theater. This show is Monday, Jan. 31, at the Strand. Munkith Al-Najjar is Shreveport's best-known Iraqui exile. A dynamic scientist, designer of planetariums and people manager, he heads an ambitious group of thinkers at Sci-Port. Times reporter Margaret Martin profiled him January 2. If you missed the story, look lively. Gannett only allows the Times to keep articles in the open archives for 7 days. One thing the Times didn't cover is his actual name. He is Munkith Al-Najjar. While he is routinely called "Al," he says Munkith means "savior" and Al - Najjar means "the - carpenter." This may sound very Christian but it is not, he added. As exciting as Sci-Port is, I believe the web site deserves an overhaul. Their "Current Discoveries" publication, though, is a riot and includes a useful calendar. Are you a SciPort member? Inundate yourself in the enchanted sounds of a string quartet. It is a delicious antidote for tension and a relief from the hurly-burly of the holiday season. The Premier Quartet, principal players with the Shreveport Symphony Orchestra, perform Thursday, January 6, at 7:30 at Hurley Music Building , Centenary College campus. Parking is easy. The concert hall is gorgeous. The lighting is warm, the seats comfy, the acoustics clear and balanced. Onstage will be violinists Kermit Poling and Elizabeth O 'Bannon, violist Borys Smolaga and Cellist Ruth Drummond. Tickets for the Ellington, Gershwin, Ravel and Daugherty program are $15. Students are $5. Teachers and librarians are trying to wean students from diskettes and get them to pack a flash drive. These USB devices store more, are hardier and last indefinitely. Cost? $30 full price; about 10 bucks on sale. Size? A cheap 64 mb will do; 128 mb models are often on sale for ten. The little items are "fashion accessories," says the NYTimes. They come in colors and varied shapes. I recommend the narrow rectangles because of the tight USB port areas on some PC's. Who uses them? Everyone from physicians to kids. Anyone who needs to transfer data from home to work or school. You can also store photos and mp3's on them. 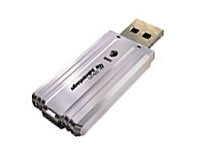 The Micro Advantage 128 mb model above is often on sale at Office Max for $10, I was told by a clerk. Here's more on flash memory from Wikipedia.org. Originally uploaded by trudeau. You may enjoy his kind of indie film-and-personality blog: www.etaoinshrdlu.net/blog/. She's cute; she cuts the musical mustard. Catch her on NPR. From NPR.org, January 4, 2005: "Alison Krauss and her band will start a tune again and again until it sounds as good as they imagine it. Krauss and members of Union Station perform at NPR and discuss their desire for perfection with NPR's Steve Inskeep." If you miss the audio during Morning Edition, pick it up online. When I've seen her on Austin City Limits I've been knocked out. And speaking of ACL, check out their schedule for the next few weeks: Wilco, Modest Mouse, Guided by Voices, the Pixies; whew. A volcanic ashfall map that almost describes the range of the Dec. 26 Indian Ocean tsunami. Have you learned a bit about tsunamis from the recent disaster? Here's a quiz designed to stimulate reading and discussion. It's based on info from Wikipedia.com. Please see answers below. 2) A tsunami could be likened to a) Martha Stewart b) Michael Jackson. 5) The term was created by fisherman, according to wikipedia.com, who returned to harbor and were nonplussed by the destruction they found. They were surprised to find devastation because in the open sea they noticed a) only an unusual number of whales b) they became enormously hungry for a few hours c) only sea birds flying in reverse d) nothing. 6) When a tsunami hits shore it resembles an onrushing a) tide b) wave. 7) The ocean most associated with tsunamis is the a) Pacific b) Atlantic c) Indian. 8) In instances where the leading edge of the tsunami is its trough, the sea will recede from the coast half the wave's period before the wave's arrival. If the slope is shallow, this recession can exceed 800 m. People unaware of the danger may remain at the shore due to curiosity, or for collecting __ from the dry sea bottom. a) buried treasure b) tires c) pairs of sunglasses d) fishes. b) 5 to 8 c) 8 to 11 crests, or waves. a) boogalamis b) king konganamis c) giant squidnamis d) megatsunamis. 12) The most famous tsunami of Mediterranean history occurred when the volcano under the Greek island of Santorini exploded. The resulting train of waves devastated a large island known for its high culture: a) Crete b) Malta c) Atlantis d) Sicily. 13) The December 26, 2004, __ Ocean earthquake initiated the world’s most destructive tsunami. a) Indian b) Pacific c) Antarctic. 14) Tsunami destruction took place in these nations (please mark Y or N for each nation): a) Indonesia b) Thailand c) Malaysia d) Bangladesh e) India f) Vietnam g) China h) Sri Lanka i) Japan. It even affected the coastlines of j) Somalia k) Egypt. 15) Future shock: scientists say a megatsunami may one day kill hordes of people on the east coast of the US and the western coast of Africa - the toll may reach the millions. The volcanic earthquake undersea landslide to precipitate this horrendous event must be in the __ islands. a) Philippine b) Canary c) Hawaiian d) Caribbean. a) shallow b) deep underwater shelf. 2) b) Michael Jackson has suffered several embarassing waves; Stewart has had only the big one. 16) b) deep underwater shelf. One of the nicest upgrades of 2004: a wide strip of pavement encircling Betty Virginia Park, one of the city's common grounds. 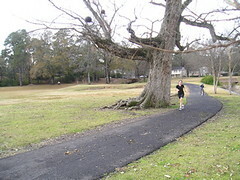 Walkers and joggers of all backgrounds circumnavigate the park beneath oaks, pines and cypress trees. The kid's area has a new island of gymnuptial objects and a floor made of magical cork/stuff. One of the people to thank: city councilman Monty Walford, 222-5430, or monty@jm-aircraft.com. Whose illustrations come to mind, given the scabrous gnarls of this venerable oak? Englishman Arthur Rackham, perhaps?